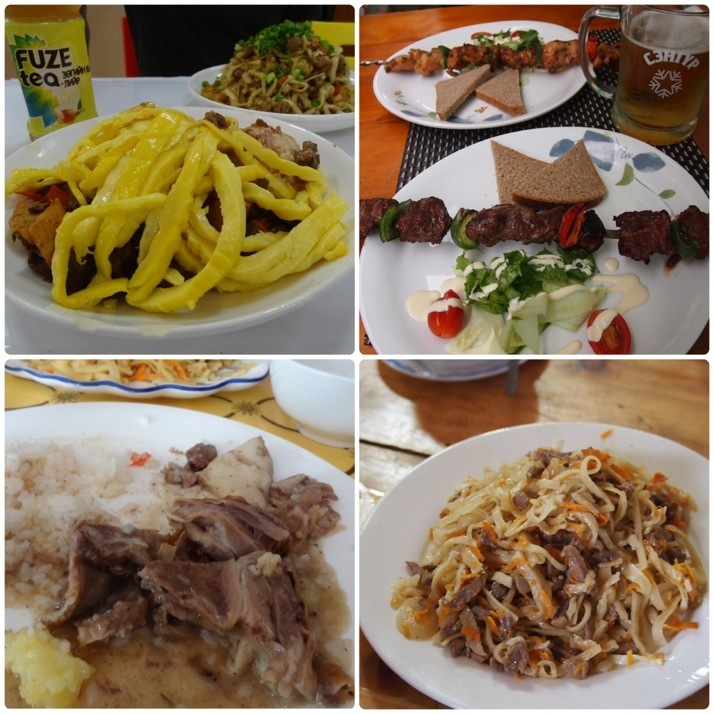 Mongolians are very suspicious of vegetables and so most meals will consist of meat and some form of carbohydrate (noodles, potato, rice, dough, etc.). Some of the most common quick meals are the dumplings. Buuz are steamed meat dumplings (very similar to the ones that we ate in Ulan Ude with Nadya) and Khuushuur are the same ingredients, but flatter and deep-fried. In cafes these are usually priced individually and so you just order however many you want to eat (we found somewhere between 4 and 6 to be about right). On one of our first days in Ulaanbaatar we wanted to try some local food and managed to find a small cafe that seemed to fit the bill. 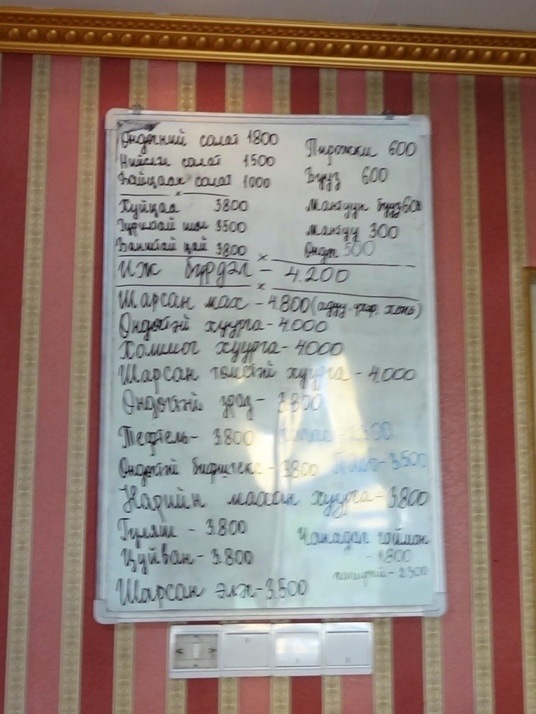 The menu was only in Mongolian and even worse it was hand written so we couldn’t even try to say some of the things as written Cyrillic is not easy to decode! In the end we took pot luck and walked over to the board and pointed out a random line to our waiter. It worked out pretty well – Andrew got a fried meat and potato hash, and I got something a little bit similar but with pieces of omelette stirred through and a large steamed bread roll on the side. We’ve already written a little about the Mongolian barbecued goat that we ate on our Gobi trip. On our 8 day trip to eastern Mongolia our driver stopped at a local ‘restaurant’ (it seemed to just be the family’s front room where they fed people if anyone turned up). There was no choice, you could have boiled mutton with potato and vegetables and that was it. We agreed and the lady of the house got the fire going and cooked the meal in a large pot over it. About 30 minutes later it was ready. Unfortunately for this post, we were too shy to take a photo of it with the family watching us, but we each got a huge piece of meat on the bone (maybe half a leg), a single potato, half a carrot and a piece of swede, along with a bowl of the cooking broth – Mongolian proportions! We were then issued with an incredibly sharp 6 inch long knife to cut the meat off the bone (but no fork so plate to mouth was done with our fingers). It was definitely a memorable meal and amazingly cost just £3 each. Another strong feature of Mongolian cuisine is dairy. We were quite excited when we first heard this as we love cheese, but Mongolian cheese is a bit different to what we’re used to… It’s sour and very hard and a bit of an acquired taste. One day, suffering cheese withdrawal symptoms, we bought a tiny Brie from the supermarket for an extortionate amount (about £5) – our guesthouse owner thought we were crazy! Mongolian yoghurt is good though. One of the families that we stayed with gave us some fresh goat yoghurt to drink. It was delicious, and still warm! You know you’re in the middle of nowhere when there’s no choice of tea or coffee, it’s just tea and no one asks ‘milk and sugar?’ you get what the locals drink… In much of Russia that’s black tea with lots of sugar, but in Mongolia it’s very milky and salty (yes really) – someone might have waved a tea bag past it at some point, but not so that you’d notice… Actually it’s not bad when you know what to expect and we got quite a taste for it. 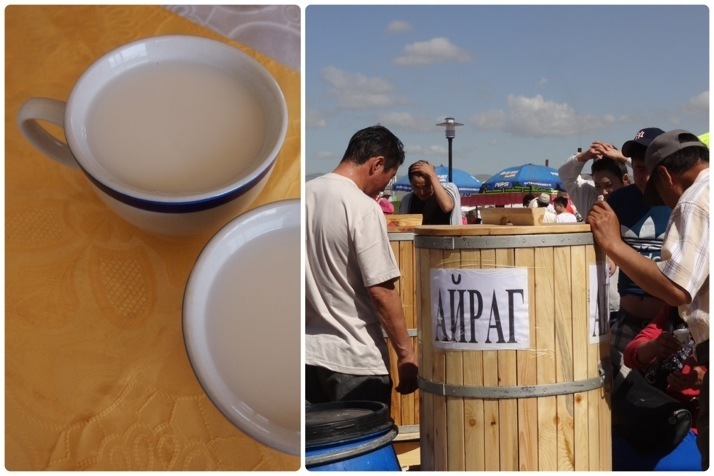 Mongolians also get creative with their dairy products by making them into alcohol. The most common is fermented mare’s milk called ‘airag’. This is sold all over the countryside on the roadside and can have a very low alcoholic content up to about 10%. We tried airag a couple of times and it was OK, a bit like fizzy yoghurt, although I suspect that if you drank a lot of it you would feel very poorly the next day. We heard tales of vodka made from milk too but we didn’t get chance to try it so we’ll have to leave that to our imaginations! 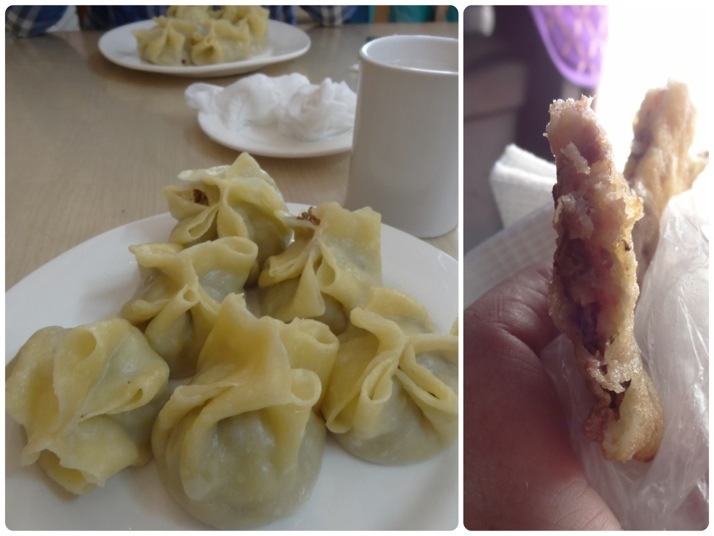 This entry was posted in Experiences and tagged cuisine, meat, Mongolia, tea on August 14, 2013 by Julie. I’ve got to say none of that looks especially appetising! Apart from the kebab things. What is 26 + 27 ?